The kidnapped lecturer of Environmental Design & Management of Obafemi Awolowo University, Dr Femi Omisore has been released during the early hours of today. 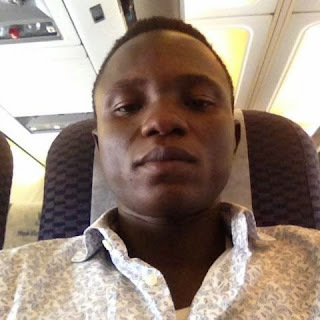 In a report posted on Punch, the Chairman of the Academic Staff Union of Universities, OAU chapter, Dr Caleb Aborisade confirmed his release. It will be recalled that Omisore was abducted on his way to a funeral ceremony at Oye Ekiti two Saturday ago. 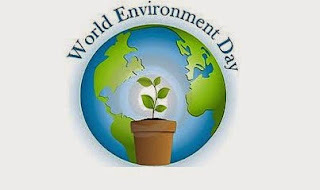 Earthplus, a non-profit pro-environment organization established in Nigeria is pleased to announce its first essay competition to mark World Environment Day this year. What would you do to preserve the environment? Other Consolation Prizes including Earthplus branded materials for three runners-up. The competition is open to Nigerian attending a Nigerian University or higher institution of learning. The essay should be between 300- 500 words and must be sent as a word document. 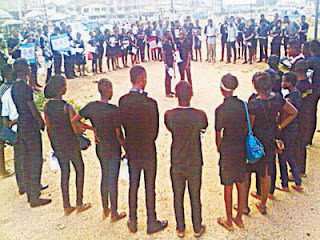 GRIEF, tears and anger were visible on the faces of scores of students of Obafemi Awolowo University (OAU), Ile-Ife, Osun State as they matched out in long procession during a candle-light procession in honour of one of them, Miss Mary Motunrayo Ibitoye. The late Ibitoye, a Part Two law student was gruesomely sent to her early grave two weeks ago by a careless school bus driver in Osogbo, the capital of Osun State. We learnt that Ibitolu had gone to a bank in Osogbo on the fateful day to cash some money but was compelled to rush home to take her identity card to facilitate the banking transaction. 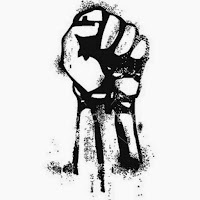 The Election Petition Committee has confirmed to OAU Peeps News Agency that it has received a petition from one of the aspirants in the last Students' Union election challenging the eligibility of Oketooto Oluwaseun a.k.a Hon. Seun, the Secretary General-elect of the Students' Union and that justice will be done. 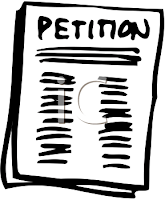 Adeyemo Akintunde, the Electoral Petition Committee chairman told us during a telephone chat that his committee following several social media arguements that has been ongoing for some days now has finally officially received a petition bordering on the eligibility of Hon. Seun on Monday 18th May, 2015 at about 6:00pm. The course registration for harmattan 2014/2015 has finally began but laden with challenges as expressed by Great Ife students. 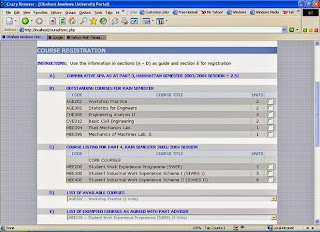 Even as students are glad that the long awaited course registration has been activated, they have however continue to express the problems and challenges that come with the registration as they cannot register courses without completing the Teaching Assessment Form online. According to some students, they cannot even assess most lecturers that took them on some of their previous courses because their names are not online. "Whenever I try clicking one of my courses, it will tell me that the Course Lecturer(s) for that course is yet to be defined by his/her HOD. To Assess the Lecturer, inform the Course Lecturer(s) to request his/her HOD to define him/her in the Course Allocation Form on the E-PORTAL for Rain 2013/2014 Session." 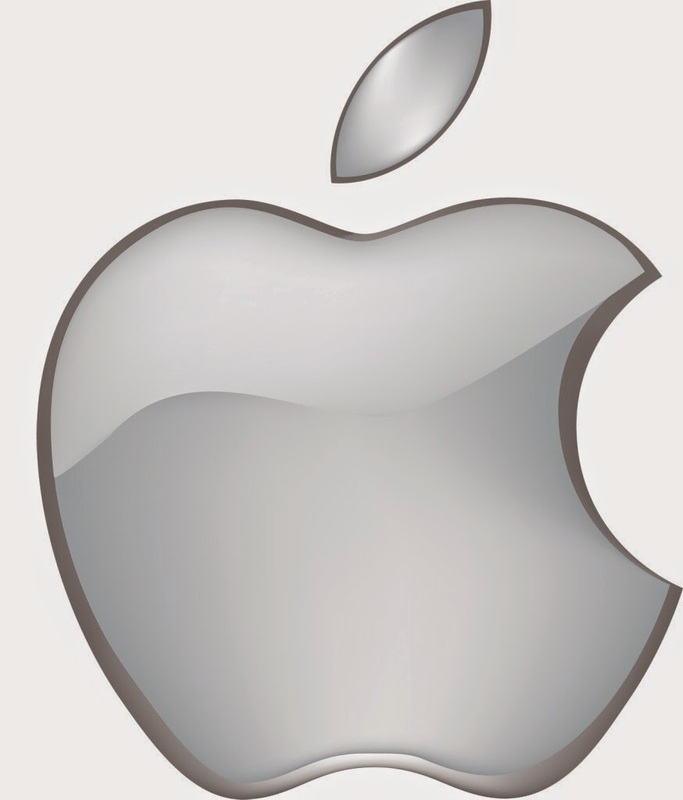 Apple has bought Mr. Chinedu Echeruo’s Hopstop.com for one billion dollars, The Wall Street Journal’s publication, AllThingsDigital has reported. Founded in 2005, Hopstop.com makes mobile applications for both iOS and Android that covers over 300 cities and that helps people get directions or find nearby subway stations and bus stops. Terms of the deal have not been disclosed as at the time of this report. Echeruo, formerly an analyst at the investment banks and hedge funds, founded Hopstop.com in 2005. Echeruo is now Chairman of the Board for Hopstop, and has been compared to Israel’s Waze, which was recently acquired by Google for $1 billion. The move is seen as Apple’s plan to bolster its map offering, especially given Google’s recent acquisition of Waze. A serial entrepreneur, Echeruo grew up in the Eastern part of Nigeria and attended Kings College, Lagos. The course registration for students of Obafemi Awolowo University for the Harmattan semester of the 2014/2015 academic session has finally started. A 72-hours delay was experienced in opening the e-portal for the registration as against the 18th May, 2015 date initially set for it. All registered students are expected to log in to their e-portal page and register courses for this semester bearing in mind that there are limited Special Electives to register. It is a great joy for you gaining into one of the best universities in Nigeria. 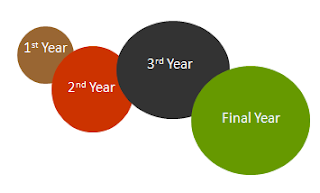 You have stressed yourselves through rigorous reading for your UTME and Post-UTME and it fortunately paid off. I am sure you were very joyous when you checked and saw your name on the JAMB and the school portals. I congratulate you for your admission into Obafemi Awolowo University. Before i proceed, let me at this junction tell you some useful secrets of success in this institution. As soon as you enter the campus, make friends with some of your course mates. Make good and zealous friends, collect their numbers and make sure you chat or call them when you want to ask questions. Try to make good friends, keep company of good ones and be of good friend to them too. 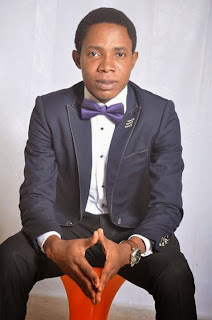 The former Angola Hall Chairman and an aspirant to the post of the Secretary General of the Great Ife Students’ Union during the last elections, Comrade Ibiyemi Joseph has said the much embattled Secretary General-elect of the Union, Oketooto Oluwaseun a.k.a Hon. Seun has to come out to prove his eligibility so as to wash himself clean from the allegations levelled against him. Ibiyemi who confessed to have had a prior knowledge of this allegation against Hon. Seun even during the election said he did not bring it up then because he had little or no evidence to raise any dust during that time so as not to tarnish his image. 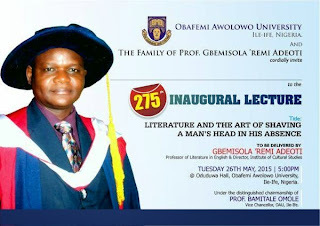 The University’s 275th Inaugural lecture:“Literature and the art of shaving a man's head in his absence” by Prof. Gbemisola 'Remi Adeoti, holds on Tuesday, 26th May, 2014 at the Oduduwa Hall, by 5:00pm. Professor Gbemisola 'Remi Adeoti is a professor of Literature In English & Director, Institute of Cultural Studies, Obafemi Awolowo University. 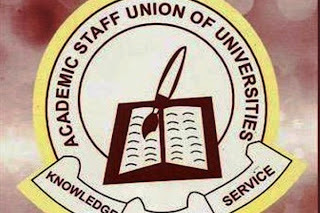 Members of the Academic Staff Union of Universities (ASUU) yesterday protested the kidnapping of its members in Ekiti State, and threatened to withdraw their services, if the victims were not rescued by Friday, May 22. The body lamented that the captors were demanding N210 million as ransom for the release of three out of five members kidnapped at different locations, describing the scenario as frightening and disturbing. ASUU members, led by Ekiti State University, Ado-Ekiti chapter chairman, Prof Olufayo Olu-Olu were protesting the kidnapping of Dr Femi Omisore , a lecturer at the Obafemi Awolowo University, Dr Folasade Alade of EKSU and Dr. Kikelomo Adegun , wife of the former Chief Medical Director of the Ekiti State University Teaching Hospital, Ado Ekiti. 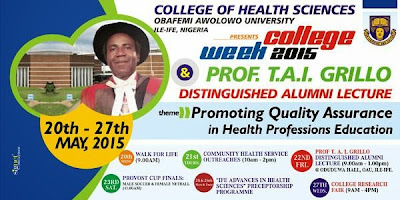 The 2015 College of Health Sciences Week boasts of several interesting programs of both academic and community relevance and is an avenue to share our work, experiences and projects with the University community and the public at large, while rendering health screening and counseling services to members of the public during our community health outreaches holding at the OAU motion ground and the Ife Central Market on Thursday 21st of May, 2015. Exposing painful and hidden realities is our motto and will conthnue to be our motto. Evidence of electoral fraud by OAU SU Sec.Gen Elect reached our desk yesterday very early in the morning,the evidence accused Honourable Seun of having below 2.5 CGPA during the last OAU SU election,which would mean he did not meet one of the requirements for participation in the students' Union election. Anybody below 2.5 CGPA cannot participate in the election. 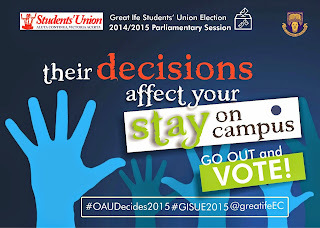 The evidence revealed that honourable Seun had 2.39CGPA as at the time of the SU elections. 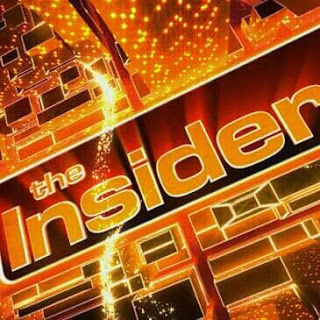 Insider sought the reactions of the General Secretary elect and he denied all allegations,saying his political enemies are behind his ordeal,he went to label a top journalist a 'daft' for reporting the allegation. In a democratic setting,should journalists be in prisons,should not we have freedom of information? The chairman of the Great Ife Students’ Union Electoral Commission, Ikudayisi Johnson Olawale a.k.a Ekiti who was in charge of the 2014/2015 Students’ Union election that gave Oketooto Oluwaseun a.k.a Hon. Seun the mandate to serve as the Union’s Secretary General has come out to say that it is not in the power of the Electoral Commission to ascertain the real CGPA of students during elections as this is the sole duty of the Division of Student Affairs(DSA) of the University. In response to our questions on the widespread allegation against Hon. Seun’s eligibility to contest the last election, Ekiti insisted that the Commission which he led could not have known the real CGPA of Hon. Seun except if the Division of Students Affairs(DSA) verified that irrespective of the documents submitted by him to the Commission and their own results assessment. As the May 29 inauguration of Nigeria’s President-elect and the Vice President-elect draws closer, pressure is mounting on the White House on who to represent the United States at the event. 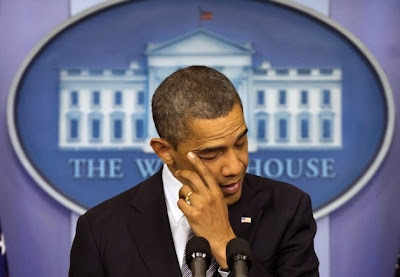 While the immediate past U.S. Assistant Secretary of State, Johnnie Carson, is asking President Barack Obama to send his deputy, Vice President Joe Biden, to lead the American delegation to the event, a pro-Africa U.S. lobby group in Washington DC and the Christian Association of Nigerian-Americans, CANAN are requesting President Obama to attend the event himself. In a press statement over the weekend Mr. Carson, who had advised Obama as the most senior government official on Africa (after the Secretary of State) until late 2013, however, requested that the U.S. President visit Nigeria in July while heading out to East Africa as already announced. The elected Secretary General of the Great Ife Students' Union, Oketooto Oluwaseun a.k.a Hon. Seun has said he does not have anything to say about the allegation of inadequate results used for contesting at the last Students' Union elections since he passed through the normal process of screening during the electioneering process. In a telephone chat with Hon. Seun this evening to verify the veracity of the pervaded allegations against him, he insisted that any complain or grievances against his election should be directed to the Electoral Commission and the Division of Student Affairs(DSA) since he passed through the normal electioneering screening and no objection was raised against his candidature then. The Secretary General-elect of the Obafemi Awolowo University Students' Union, Oketooto Oluwaseun Olanrewaju a.k.a Hon. Seun has been accused of violating one of the election guidelines that gave him the mandate to occupy his new office. In an alleged exhibit studded message sent to us, Hon. Seun failed to meet the minimum 2.5 CGPA requirment for any contestant vying for any position at the Students' Union leadership. The sender also wrote "Well, I think it has been substantiated with the Exhibits I released. All you need is to sit and watch the drama as it unfolds at the Tribunal. You can't be ineligible for an election and have the Mandate...its never done and it can't stand. Ekiti(Electoral Commission chairman) is a failure and I am all out to prove that...thanks." 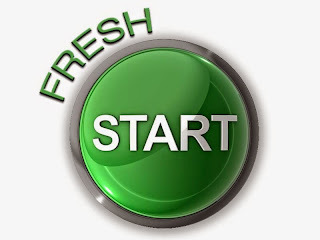 The management of Obafemi Awolowo University's number one online news portal, OAU Peeps News Agency welcomes all fresh students of the 2014/2015 academic session to Africa's most beautiful campus. We urge you all to remain focused on the primary reason you are on Great Ife campus even as you get socially integrated into the system with various activities. We wish you the very best of God in all your endeavours!